Robert E. Lee, general, Confederate States of America, U.S. Scott No.1049. Robert E. Lee (right of stamp) general, Confederate States of America, U.S. Scott No. 982. Jefferson Davis, president, Confederate States of America, Scott No 1. Alden Partridge (U.S. Scott No.1854), captain, superintendent of the USMA. Montgomerv Blair (U.S. Scott N6. C66; Belgium Scott No.868), U.S. postmaster general. George Washington Goethals (Canal Zone Scott No,106) major general, builder of the Panama Canal. Ulysses Simpson Grant - Portuguese Guinea Scott No. 254. In at least one respect, the United States Military Academy at West Point probably can claim an advantage over any other institution of higher learning: That is the percentage of its graduates who have appeared on postage stamps of the world. 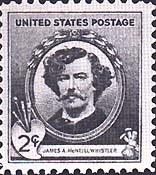 Thirty-two West Pointers have been pictured on postage stamps, including thirty graduates and two other distinguished attendees of the academy -- Edgar Allan Poe and James (Abbott) McNeill Whistler -- who never finished the curriculum of the thirty graduates, the two who later became president of the United States quite naturally have been honored most often. 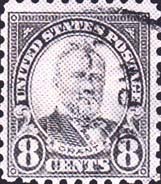 Ulysses S. Grant, class of 1843, has appeared on forty different postage issues. He is followed closely by Dwight D. Eisenhower, class of 1915, who has appeared on thirty-seven stamps. 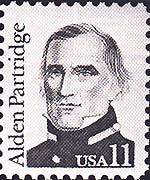 The senior West Point graduate honored on postage stamps is Alden Partridge of Vermont, class of 1806, an early superintendent of the U.S. Military Academy, the founder of Norwich University in Ver-mont, and the father of the Reserve Of-ficers Training Corps (ROTC) system in the United States. He appears on a stamp in the current U.S. Great Americans Series. 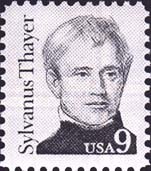 The second senior graduate is Sylvanus Thayer of Massachusetts, class of 1808, who succeeded Partridge as West Point superintendent in 1817 and served in that capacity until 1833. His methods of teaching and training cadets are still in use at West Point, and he generally is considered the "Father of the Military Academy." He, too, appears on one of the Great Americans Series stamps. Third in seniority among West Point graduates honored on stamps is Jefferson Davis of Mississippi, class of 1828, who later became president of the Confederacy. He appears on one U.S. and eight Con-federate stamps. Robert Edward Lee of Virginia, class of 1829, was general-in-chief of Confederate Armies during the American Civil War, and most USMA graduates consider him the epitome of West Point honor and valor. His likeness appears on four U.S. stamps. 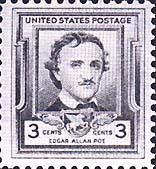 Edgar Allan Poe, poet, author, and ex- cadet of the class of 1834, appears on one U.S. stamp, as does James McNeill Whistler, renowned artist and ex-cadet ofthe class of 1855. Another U.S. stampshows Whistler's well-kown portrait of his mother. Montgomery Blair of Kentucky, class of 1835, is an interesting West Point graduate. He is honored on one U.S. and one Belgian stamp for his role in develop-ing the Universal Postal Union (UPU) while serving as U.S. postmaster general from 1861 to 1864. The UPU, of course, has been honored coundess times on stamps of almost every naflon of the world. One member of the Academy's class of 1840 has been honored on stamps. 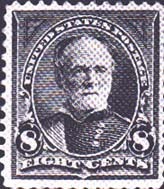 William Tecumseh Sherman of Ohio, Union general, appears on seven stamps of the United States, Guam, the Philippines, and Puerto Rico. He undoubtedly could have been president of the United States if he had chosen to run for election. Ulysses Simpson Grant of Ohio, class of 1843, commander-in-chief of Union forces during the American Civil War and eighteenth president of the United States, is pic-tured on thirty-six stamps of the United States and its possessions. He also is shown on two stamps of Portuguese Guinea in honor of his arbitration of the British-Portuguese dispute over the territory in 1868, and on one stamp each of Liberia and St. Vincent in their respective Presidential Series. The American Civil War also accounts for the next two graduates of the U.S. Military Academy to appear on stamps. Thomas Jonathan "Stonewall" Jackson of Virginia, class of 1846, was Lee's ablest lieutenant; Philip Henry Sheridan of Ohio, class of 1853, was Grant's cavalry leader. 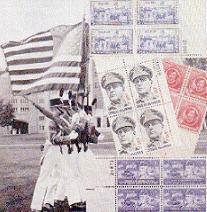 Both appear on stamps of the U.S. Army-Navy Series of 1936, along with Lee, Sherman, and Grant. Jackson, Lee, and Jefferson Davis also appear on the U.S. Stone Mountain issue of 1970. All of the next group of USMA gradu-ates to appear on stamps were members of the U.S. Army Corps of Engineers, and all were involved in the building of the Panama Canal, a construction project that spanned a decade, 1904-14. George Washington Goethals of New York, class of 1880 and chief engineer of the Panama Canal project, is shown on one U.S. and fourteen Canal Zone stamps. His subor-dinates, Harry F. Hodges of Massachu-setts, class of 1881; and David DuB. 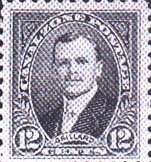 Gaillard of South Carolina, who gave his life to the canal, and William L. Sibert of Alabama, both class of 1884, appear on a total of eight Canal Zone stamps. 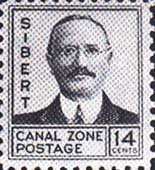 In addition, the canal's Gaillard Cut is pictured in various ways on twenty-nine Canal Zone stamps. Only one West Point graduate is honored on stamps for his service to the nation during World War I: John Joseph Pershing of Missouri, class of 1886, appears on a U.S. regular issue of 1954 and a French issue of 1987. Like Sherman, Pershing probably John J. Pershing, U.S. Scott No. 1042A and France Scott No.2044. could have been president of the United States if he had sought the office. Douglas MacArthur of Wisconsin, class of 1903 and the youngest American brigadier general during World War I, was honored for his Worid War II service in the Pacific and for his Korean War service on one U.S., one Korean, and nine Philippines stamps. Henry Harley "Hap" Arnold of Pennsylvania, class of 1907, who built the greatest air force in history during World War II, appears on a recent stamp of the U.S. Great Americans Series. George Smith Patton Jr. of California, class of 1909, is shown on one U.S., five Belgian, and four Luxembourg stamps for his World War II service in the European Theater. Dwight David Eisenhower of Kansas, class of 1915, is pictured on the postage stamps of more countries than any other USMA graduate. His service as commander-in-chief, Europe and North Africa, during World War II and as thirty-fourth president of the United States has been honored on six stamps from the U.S., one from Brazil, two from Grenada, four from Korea, one from Liberia, one from Monaco, one from Panama, two from the Philippines, six from El Salvador, one from St. Vincent, seven from Togo, four from Uruguay, and one from Gibraltar. Finally, from World War II, Anthony C. McAuliffe of West Virginia, class of 1919, "the hero of Bastogne" is honored on one of the same Belgian stamps that depicts General Patton. An interesting group of twelve Nicaraguan stamps issued to commemorate the Nicaragua Military Academy (NMA) also depicts various USMA graduates, as follows: Fred T. Cruse of Kentucky, class of 1907, the second superintendent of the NMA; Charles Love Mullins Jr. of Nebraska, class of April 1917, the founder of the NMA and its first superintendent; Leroy Bartlett Jr. of California and John F. Greco of Minnesota, both class of 1930 and both superintendents of the NMA; and Anastasio Somoza Jr. of Nicaragua, class of 1946, a superintendent of the NMA and later president of Nicaragua. 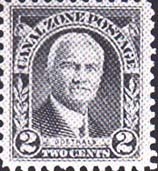 Somoza also appears on sixteen other stamps of Nicaragua and four of El Salvador, for a total of twenty-one and third place on the most-depicted list, after Grant and Eisenhower. Finally, West Pointers from the classes of 1950 through 1955 who went on to become astronauts appear on a total of forty stamps world-wide. In order, they are: Frank Borman of Arizona, class of 1950, the first lunar circurnnavigator, who appears on ten stamps of Haiti, Hungary, and Senegal; Edwin E. Aidrin Jr. of New Jersey, class of 1951, and Michael Collins of Louisiana, class of 1952, of the first lunar landing team, who together appear on sixteen stamps of Algeria, Belgium, Brazil, Cameroon, Congo, Liberia, Monaco, Quatar, Romania, Togo, Upper Volta, and Venezuela; the late Edward H. White II of Oklahoma, also class of 1952, who gave his life to the astronaut program and who appears on twelve stamps of Cameroon, Hungary, Nicaragua, Niger, and Togo; and David R. Scott of Califor-nia, class of 1954, and Alfred M. Worden of Michigan, class of 1955, both of the Apollo 15 mission, who appear on two stamps of Hungary and Romania. In conclusion, those stamps should be mentioned that honor West Point itself -and thus all of its graduates, as well as the military academies in Korea, Nicaragua, and the Philippines, which were modeled directly after West Point. The complete listing accompanies this article. Scott numbers have been used throughout; non-Scott listed stamps have not been included in the listing. I will welcome any additions or corrections to the list. Class of 1806 - Alden Partridge (U.S. Scott No.1854), captain, superintendent of the USMA. Class of 1828 - Jefferson Davis (U.S. Scott No.1408; CSA Scott Nos. 1, 4, 6, 7, 9, 10, 11, 12), president, Confederate States of America. Class of 1829- Robert Edward Lee (U.S. Scott Nos. 788, 982, 1049, 1408), general, Confederate States of America. Class of 1834- Edgar Allan Poe, ex-cadet (U.S. Scott No.986), poet, author. Class of 1835 - Montgomerv Blair (U.S. Scott N6. C66; Belgium Scott No.868), U.S. postmaster general. Class of 1840 - William Tecumseh Sherman (U.S. Scott Nos. 225, 257, 272, 787; Guam Scott No.7; Philippines Scott No.222; Puerto Rico Scott No.213), general, U.S. Army. Class of 1843 - Ulysses Simpson Grant (U.S. Scott Nos. 223, 255, 270, 281, 303, 314A, 560, 589, 640, 666, 677,787, 823, U293, U330-35, U377-78, U390-92; Cuba Scott No.225; Guam Scott No.5; Philippines Scott Nos. 216, 299, U1S-16, U26; Puerto Rico Scott Nos. 212, U2, U4, U14; Liberia Scott No.913; Portuguese Guinea Scott Nos. 254, 339; St. Vincent Scott No.439), general, president of the United States. Class of 1846 - Thomas J. Jackson (U.S. Scott Nos. 788, 1408), general, CSA. Class of 1855 - James (Abbott) McNeill Whisfier, ex-cadet (U.S. Scott No.885), artist. Class of 1880 - George Washington Goethals (U.S. Scott No.856; Canal Zone Scott Nos. 106, 117, 153, 158, Ull, U13, UlS, U16-19, C3, CS, 02), major general, builder of the Panama Canal. 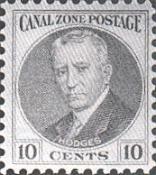 Class of 1881 - Harry F. Hodges (Canal Zone Scott Nos. 108, 161, 04), major general. Class of 1884 - David DuB. Gaillard (Canal Zone Scott Nos. 109, 122-23, C39), lieutenant colonel.- William L. Sibert (Canal Zone Scott No. 110), major general. Class of 1886 - John J. Pershing (U.S. Scott No. 1042A; France Scott No. 2044), general of the armies. Class of 1903- Douglas MacArthur (U.S. Scott No.1424; Korea Scott No.477; Philippines Scott Nos. 519-21, 971-72, 1449-52), general of the army. Class of 1907 - Fred T. Cruse (Nicaragua Scott Nos. C465, C471), colonel. -- Hemy H. Arnold (U.S. Scott No.2192), general of the army and of the air force. Class of 1909-George S. Patton Jr. (U.S. Scott No. 1026; Belgium Scott Nos. B606-10; Luxembourg Scott Nos. 24245), general. Scott Nos. 203-205, C371; St. Vincent Scott No.443; Gibraltar Scott No.436), general of the army, president of the United States. Class of April 1917 - Charles L. Mullins Jr. (Nicaragua Scott Nos. C463, C469), major general. Class of 1919 - Anthony C. McAuliffe (Belgium Scott No. B608), general. Class of 1930 - Leroy Bartlett Jr. (Nicaragua Scott Nos. C465, C471), colonel. - John F. Greco (Nicaragua Scott Nos. C465, C47 1), colonel. Class of 1946 - Anastasio Somoza Jr. (Nicaragua Scott Nos. 995-96, C884-86; C465, C468, C471, C474, C778-85; El Salvador Scott Nos. 789-90, C250-5 1), general, president of Nicaragua. Class of 1950- Frank Borman (Haiti Scott Nos. 54447, C263-65; Hungary Scott No. C284; Senegal Scott Nos. 493, 494c), astronaut, colonel. Class of 1951 - Edwin E. Aldrin Jr. (Belgium Scott Nos. 693, B846; Algeria Scott No.427; Brazil Scott No.1138; Cameroon Scott Nos. C135-36; Congo [Brazzaville] Scott No. C85; Liberia Scott No. C184; Monaco Scott Nos. 772-73; Quatar No.191; Romania Scott No. C175; Togo Scott Nos. 741, 746; Venezuela Scott No. C1019), astronaut, colonel. Scott No. C1019), astronaut, colonel. - Edward H. White II (Cameroon Scott No. C60; Hungary Scott No. C275; Mali Scott No. C33; Nicaragua Scott Nos. C618-25; Niger Scott No. C56; Togo Scott No. 544), astronaut, lieutenant colonel. Class of 1954 - David R. Scott (Hungary Scott No. C315; Romania Scott No. C185), astronaut, colonel. Class of 1955 - Alfred M. Worden (Hungary Scott No. C315; Romania Scott No. C185), astronaut, lieutenant colonel. The Author Col Frederick 0. Diereks is a 1937 graduate of the U.S. Military Academy at West Point, commissioned in the Corps of Engineers. During World War II, he commanded an Engineer Battalion in France and Germany as a lieutenant colonel. He retired in 1967 after thirty years of active military service and subsequently became associate director of the U.S. Coast and Geodetic Survey in the Department ofCommerce. Col. Diercks is a member of the APS, the American Topical Associatton, the Canal Zone Study Group, and the Bermuda Collectors Society.